Hayden turned six this month! He’s getting bigger all the time (still 90th percentile in height). He’s starting Kindergarten at the big school, he’s been taking loads of field trips at day care this summer (and riding the bus to those), and he’s doing more and more things for himself (begrudgingly). He had his birthday party at Ben and Ari’s this year. The kids got tokens and played arcade games for a while, then we went to the party room and ate pizza and cake. Afterwards most kids left except Jesse and Robby and the 3 of them played two rounds of mini golf. 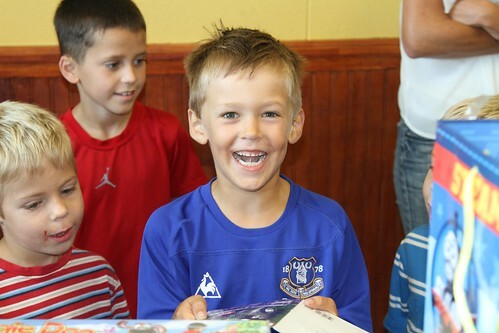 Hayden was soooo excited about his party and had an absolute ball. After that we went home and played with some of his presents before swimming for a while in the neighborhood pool. We rounded off the day with dinner at Red Robin with the Carter’s. The staff sang Happy Birthday to Hayden and he got a little ice cream sundae. We are lucky to have such a fun, sweet little boy! It’s been great fun to watch him grow and change.